Jim’s FIRST and Inspirations Paint & Colour Dunsborough are the two trading entities of Paint It Pty Ltd. Established in December 1995 as a partnership of two in a store of 100 square metres, we have grown into 2 businesses with a total floor space of 700 square metres and employing a staff of nine. We have a diverse client base of retail, DIY, tradesmaen, hospitality, service industry, wine production, building trades and light manufacturing. Our rural location means steel roofing and associated tools and materials are a major part of our daily routine. 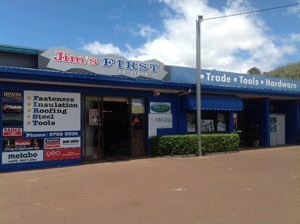 Jim’s FIRST is the aconym for Fasteners, Insulation, Roofing, Steel and Tools. We stock a healthy range from the leading major brands available in Australia, and we pride ourselves on procuring tools and other accessories not readily available off the shelf. Customer service is paramount and we pride ourselves on the reputation of good quality, value and satisfaction that our clients attest to daily.